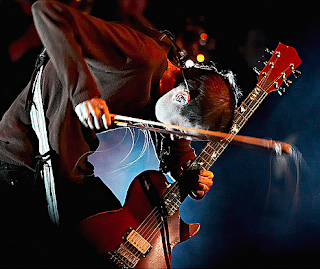 iconic guitar.com: Jonsi Por Birgisson - "Bird"
Jonsi Por Birgisson - "Bird"
Jonsi of Sigur Ros uses a custom guitar that was handcrafted by his former guitar tech Dan Johnson. It features a single Seymour Duncan ’59 humbucker pickup and a built-in treble boost circuit. The guitar is called “Bird,” due to the bird inlays. The bird on the body below the neck was carved by Jonsi himself. He plays with a cello bow, bowing both in front of and behind the bridge, and is not particular about rosin, which his current guitar tech says seems to darken the tone.